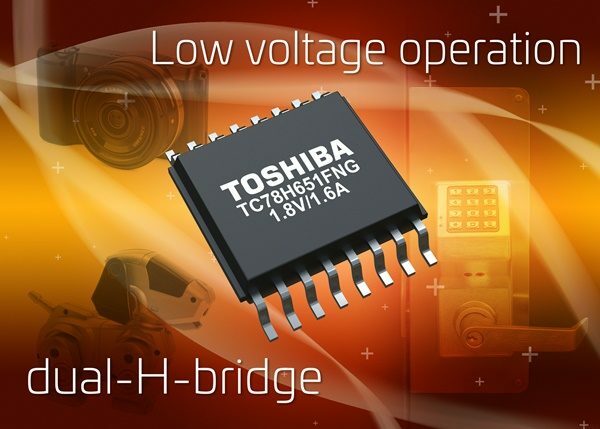 Toshiba Electronics Europe (“Toshiba”) has announced the launch of a new dual H-bridge driver IC for DC brushed motors and stepping motors. The TC78H651FNG delivers performance at a low voltage (down to 1.8V) and high current (up to 1.6A) that is essential for equipment powered by dry-cell batteries. The new device is suitable for motor applications such as cameras and compact printers using 3.7V lithium-ion batteries, toys and home appliances, smart meters, and electronic locks using two 1.5V dry batteries, and devices using 5V USB power supplies. IoT advances and wireless technologies are now everywhere and this is driving demand for applications that can be remotely controlled by smartphones and tablets, stimulating demand for battery-powered motor control. Existing H-bridge driver ICs have used bipolar technology which is stable at low voltage. However, the associated high levels of current consumption shorten battery life and increase losses leading to reduced motor torque. The new TC78H651FNG uses Toshiba’s specialized DMOS process that is ideal for low voltage drives to reduce losses and current consumption – ICC is around 0.6mA in operating mode and virtually zero when in standby mode. This achieves a longer battery life and stable low voltage operation. The reduced ON resistance of just 0.22Ω for the high and low sides combined reduces IC losses and improves torque in the motor, even when powered at 1.8V. The device is housed in a 5.0mm x 6.4mm, 0.65mm pitch TSSOP16 package and supports forward, reverse and stop rotation modes. Inbuilt error detection functions for overcurrent protection, thermal shutdown and undervoltage lockout all contribute to ensuring a safe system. For more company information visit TEE’s web site at www.toshiba.semicon-storage.com.